We find the story of Bathsheba in 2 Samuel chapter 11. I have read some articles that say that Bathsheba seduced King David. I don’t believe that version of the situation is accurate. From what I read, Bathsheba was simply bathing and was summoned by King David because of her beauty. She was stuck between a rock and a hard place. Was she supposed to say NO to the King? If she had, it would have been “off with her head!” Scripture doesn’t say whether she was pleased by the summons or felt remorse, despair etc. Imagine how she felt when she realized she was pregnant with King David’s child and married to another man. I think she panicked. I can almost hear the emotion in her message to David, “I am pregnant.” Things quickly go from bad to worse when David has Uriah killed in battle. Bathsheba becomes a widow. She is pregnant with King David’s child and is now a widow. For a moment, she must have felt completely alone to face her situation. She must have felt desperation. Maybe she cried out to God in her heartache. Scripture doesn’t tell us why God blessed Bathsheba with the birth of Solomon. Did she believe? Did she trust God to turn her heartache to blessing? I believe she did. God blessed Bathsheba in her brokenness and through her son King Solomon, she became a part of the ancestry of Jesus. God took a sinful situation and turned it for the good. He can do the same for you! If you are facing a sinful situation and feel that you are stuck between a rock and a hard place, trust that God will turn the situation into a blessing. Take it to God and let Him work in the situation. 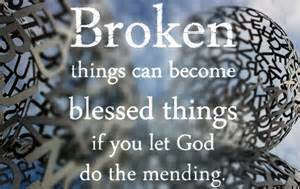 If you trust God, He can take your situation from broken to blessed. He can and will bless you abundantly despite the circumstances. I’m sure Ruth was not perfect, but unlike the other women listed in the genealogy of Jesus, we only see the goodness that was Ruth. We see that Ruth was obedient, compassionate, and had a servant’s heart toward her mother-in-law Naomi. She seemed to be the picture perfect daughter-in-law. Ruth seems to be the epitome of what a christian woman should be like. If we pay close attention to the story of Ruth, we will find that Ruth dealt with her share of trials and struggles in life. First of all, when we meet Ruth, she has recently become a widow. She is grieving the loss of her husband and is facing an uncertain future. Naomi urges Ruth and her sister-in-law Orpah to return to their own families to remarry among their own people, the Moabites. Orpah returns to the home of her family, but Ruth refuses to leave Naomi. Naomi and Ruth return to Israel, where Ruth is a foreigner. It must have been hard for Ruth to live as a stranger among the Israelites. She must have been homesick and lonely. When I was a teenager, I lived in the foster care system in Los Angeles county. I was moved several times in 3 years. I was homesick. It was hard to fit in in each new foster home/placement. How do you fit in with people who already have a relationship with each other? It was a lonely time and I can imagine how hard it must have been for Ruth. As hard as it had to have been, Ruth responded to the situation with a true servant’s heart. She could have whined about her circumstances. She could have complained that things weren’t fair. She didn’t whine. She didn’t complain. She was obedient and compassionate. Her loyalty toward Naomi was evident and God blessed her abundantly because of her attitude. I need to exhibit more of Ruth’s character in my own life. When facing my own trials and struggles, I tend to whine and complain. I try not to, but before I know it, I am whining about this or complaining about that. I need to be more obedient, more compassionate, and more willing to act with a servant’s heart. Instead of boo hooing over the tough situations in life, I need to face the challenges with joy and gratitude, as Ruth did. What situation or circumstance are you facing right now that you find yourself complaining about? In what way can you be an example of Ruth in your situation? How might this help the situation? Could it change the outcome of the situation to a more positive one than complaining will? Sometimes we can change negative circumstances into positive ones simply by facing them as Ruth did. Take the trials in your life and turn them into blessings, by facing them with a Ruth attitude. Let me know if there is anything I can pray through with you. I am here, friend. I am always available to encourage you in difficult times and pray through those times with you. God Bless! The story of Rahab is found in the second chapter of Joshua. Joshua sent out two spies to look over the land, especially Jericho. When they arrived in Jericho, they entered the house of Rahab, a known prostitute, and they stayed there. Rahab hid them on her roof and in return they spared her and her family when Israel conquered Jericho. This wasn’t the end of Rahab’s story. We read in Joshua 6:22-25 that Joshua sent the two spies to bring Rahab and her family out and Rahab lived with the Israelites for the rest of her life. In Matthew 1:5 we find her listed in the genealogy of Jesus. How does a prostitute get to be listed in the genealogy of Jesus, our Risen Savior? Through faith and obedience. She had heard the stories of how the Lord had worked miracles on behalf of Israel and she believed that the Lord had given Israel the land. She hid the spies because she had faith in the God of Israel. Through the story of Rahab, we see that God is a God of second chances. Rahab was a prostitute. She was living in sin, but because she acted on her faith, in obedience to the one true God, God restored her life and she became an ancestor to the King of kings, Jesus. Do you find yourself identifying with Rahab? Are you living in sin and can’t seem to find your way out? Believe that the one true God can and will deliver you from the sin-filled life you are living. Have faith that Jesus died for YOU and His mercy and grace are His gift to YOU. Salvation is His gift to YOU. You are beautiful and God loves you! Our merciful Father gave Rahab a second chance and He longs to give you one too. It’s never to late! Call on Him NOW and see how He can bring restoration to your life. I usually find myself skimming over the Genealogy of Jesus found in Matthew 1, but this day, something very interesting caught my eye. The names of four women jumped out at me. I had never noticed this before! These were women I knew. I had read their stories, I knew these were women with a past, and yet here they were, listed among the ancestors of Jesus. I felt the whispers of the Holy Spirit speaking to my own broken spirit. I knew I had something to learn from these women. The story of Tamar can be found in Genesis 38. Tamar was a Canaanite, who became the daughter-in-law of Judah. Remember Judah? One of the brothers who sold Joseph into slavery. Judah got Tamar as a wife for his firstborn, Er, but Er was wicked and God struck him down. Same thing happened when brother Onan took Tamar as his wife. After losing two sons, Judah decided to deceive Tamar to save the life of his youngest son. As the years pass by, Tamar realizes that she has been deceived and takes matters into her own hands. She dresses as a prostitute and tricks Judah into sleeping with her. It works and she becomes pregnant with twins. Personally, I don’t believe Tamar was a bad person. I think that she was forced into a desperate situation and dealt with it the only way she knew how. The Bible doesn’t talk about her relationship with God, but if she is listed as a direct descendant of Jesus, then she must have been a Godly woman. She had lived through marriages with two evil men, been deceived by her father-in-law and had sinned in desperation. That doesn’t make her a bad person. That makes her a broken woman who was blessed by a God who saw her condition and loved her to Him. Who can blame her? When dealing with a desperate situation that we can see no way out of, it is easy to fall into sin, as a way to help ourselves. It seems so much easier to take control of the situation ourselves, than to trust God with it and allow Him to work things out. What we find out in the end though, is that we usually make a bigger mess of things and need to go crawling to God in submission and repentance. When will we ever learn to sit still in a posture of prayer and allow God to work in His way? I am challenging you now, if you are dealing with a desperate situation that you can’t find your way out of, STOP, PRAY and WAIT on God to work things out. He will work things out, in His way, in His time and in a way that will glorify His name. Don’t give up. Don’t dig the hole deeper. Seek God! He will help you. He is waiting!